Do you think that the size and shape of the bed are the only ones that count when it comes to enjoying a comfortable sleep? You should know that the answer is not really, because what bed sheets you use may influence the way you sleep and have an impact on your health. Yes, bed sheets made out of synthetic low-quality fibers retain moisture on their surface, favoring the apparition of bed mites. Because of this, they can influence allergies, both respiratory and skin allergies. Also, synthetic fibers are not good at all for sensitive skin, as they can make all sort of rashes and irritations appear, ruining your chance of having a good night rest. What can you do in these conditions? Find high-quality bed sheets that will protect your beauty and offer you the opportunity to sleep better. The Jaipur king size bed sheets are exactly what you need. Made entirely out of natural fibers, of the highest quality, with beautiful and resistant prints, and gorgeous colors, they can fit all requirements and tastes. These 100% cotton bed sheets will allow a perfect aeration of the material while sleeping, and even if you sweat or the humidity is high, due to breathing, it will immediately dry out. Thus, these bed sheets will be perfect for persons that have sensitive skin, prone to developing all sort of issues, and for ones that have respiratory allergies. But even if you don’t have all these problems, you can still enjoy the benefits of cotton bed sheets because being surrounded by natural fibers gives you a feeling of comfort and allows the skin to breathe at all times. Check out the Jaipur printed bed sheets and take advantage of the wide variety of patterns and models from which you can choose. Match the bed sheets with the rest of the room, and give your bedroom an elegant image, with the help of this stylish bed sheets. The best part is that these sheet sets are king size bed sheets, so if you had a hard time finding sheets to cover properly your king size bed, you should know that you found them now. Also, having in consideration the superior quality of the fibers, the prices are more than affordable. Take advantage of this fact and enjoy these beautiful bed sheets in your home. 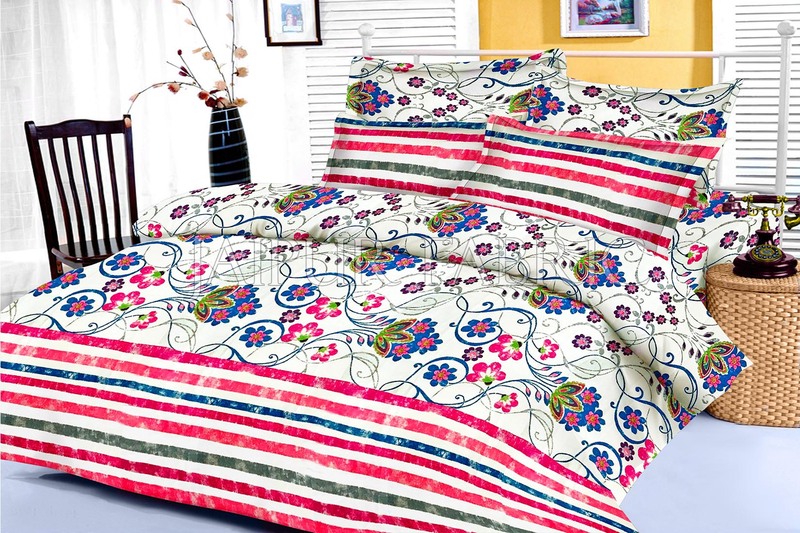 The prints and colors of the bed sheets are highly resistant and durable in time, remaining as bright and gorgeous after numerous washes, just like in the first day you bought them. This is because the cotton fibers used for their manufacturing is of the best quality and the printing processes respect the highest standards in the field. When purchasing a king size bed sheets set, your money will be well-spent because these sheets will be around for your use for many years to come. Once you try the sheets made out of this particular Jaipur fabric, you will never want to try anything else again. Your sleep can be more comfortable than what you were used to.